Time of Origin: Genetically engineered on the planet Bliss during the Dalek wars. 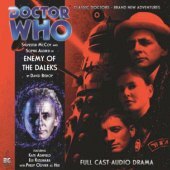 Appearances: "Enemy of the Daleks"
History: Although they only fought him once, The Doctor will doubtless always remember the Kisaabya, as his confrontation with them left him with several uncomfortable reminders of his fourth incarnation’s mission to wipe out the Daleks at their beginning ("Genesis of the Daleks"), particularly since they were created to serve essentially the same purpose for humanity that the Daleks were once intended to serve for the Kaleds. A genetically engineered life-form, the Kisaabya were the creation of Professor Toshio Shimura, inspired by his father’s collection of silkworms when he was a child, intrigued at the possibilities of what might happen if silkworms ate something other than their traditional diet. Although he was forced to turn to the military to gain the funding to support his research, Shimura’s efforts seemed to prove successful when he established a research facility on the planet Bliss, an interplanetary reserve likened to the Galapagos Islands and located outside Earth's galaxy. Once on Bliss, Shimura was able to gain access to the Ironweed plant, a metallic parasitic plant with large thorns and mercury for sap, Bliss’s unique environment causing the flora and fauna to be significantly larger than usual. Using genetic engineering technology to cross-breed silkworms with Piranhalocusts - a ruthless race of insects -, Shimura was able to create the Kisaabya, a race specifically designed to consume the Daleks. On the surface, the Kisaabya were the perfect living anti-Dalek weapon, achieving Shimura’s goal of making the Daleks less deadly by creating a predator for them rather than them remaining on the top of the galactic food chain. In their adult stage, the Kisaabya were incapable of eating flesh, instead consuming metal, but they required living flesh in order to lay their eggs so that the next generation could hatch, the larval Kisaabya - resembling enlarged Piranhalocusts - subsequently eating flesh and spinning large iron-like cocoons so that they could develop into the next stage. Shimura had intended to keep the Kisaabya contained until he could breed them to a point where they would be unable to consume human flesh, but the arrival of a Dalek attack force in the system apparently forced him to release the Kisaabya early so that they could feed and breed in his fellow scientists, reasoning that the scientists would die anyway when the Daleks arrived and their deaths would accomplish something this way. 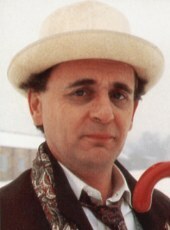 Shortly before the Kisaabya completed gestation, a Valkyrie unit - an all-female fighting force created to fight the Daleks - arrived on Bliss fleeing a Dalek ship, their arrival being closely followed by the Seventh Doctor, Ace and Hex, The Doctor having arrived on Bliss to ensure that one of the great atrocities of the Dalek wars would take place as history recorded. While Ace attempted to help coordinate the Valkyrie unit in their fight against the Daleks, Hex tried to tend to the wounded soldiers while The Doctor confronted Professor Shimura just in time to witness the awakening of the first Kisaabya. Although the Kisaabya proved effective against the Daleks - Although vulnerable to most weapons, the speed of the Kisaabya’s gestation and reproduction, coupled with their ferocity in attack, helped to counter that weakness -, The Doctor was obviously unnerved by the similarities between Shimura and Davros’s research, both having created a new race to ‘save’ their own from a prolonged war, as well as both being unprepared for their creations’ unwillingness to obey them. Shimura protested that his creations would stop the Daleks and save mankind, but the fact that the name ‘Kisaabya’ means ‘parasitic saviour’ suggested to The Doctor that Shimura knew what he was doing was ethically conflicted from the beginning. As the Daleks invaded the facility, killing the Valkyrie unit, the Kisaabya attacked the Daleks, tearing through a Dalek platoon, leaving the Black Dalek - now infested with Kisaabya eggs - as the only survivor when The Doctor discovered it. Recognising the horror of the Kisaabya when he realised that he actually felt sorry for the Black Dalek, and with the Valkyrie unit now dead, The Doctor, having confirmed that the Kisaabya’s Piranhalocust nature would drive them to expand when they could survive on Bliss, programmed the Black Dalek’s damaged casing to self-destruct - with the Dalek’s permission - while positioning it beside the base’s power cells. Reflecting on his fourth incarnation’s failure to stop the Daleks at their beginning ("Genesis of the Daleks"), The Doctor was uncertain if he had the right to destroy the Kisaabya, but also knew that it was his place in history to trigger the explosion. With the remaining Daleks on planet having ordered their ship to depart to prevent the Kisaabya spreading before exterminating themselves, The Doctor departed the base before the Black Dalek exploded, destroying the facility and the Kisaabya... the very atrocity that history recorded would take place.